New for 2013: Hunters must purchase a WIA Validation to legally hunt WIA Sites this fall. It is a nominal $3, a portion of which covers the license transaction with the remainder to be used for a hunter evaluation next year. The validation will also give DNR and policymakers a way to track the number of hunters whom hunt Walk-In Access sites. Landowners cannot give others permission to hunt without a validation. Clay County WIA # 55 is within the Clay County Game Refuge and is closed to waterfowl hunting during the regular season. Open to all other hunting. Walk-In Access sites (WIA) are only open to hunting where WIA boundaries are posted with WIA signs. Landowners may opt out of the program, and will be reflected in the Online Atlas and the WIA County Interactive Map. Check the "Walk-In Access Site Status Changes" for the latest information on WIA site conditions. ALL WIA sites are now OPEN to Public Hunting. A long winter followed by a cold, wet spring contributed to a significant decrease in Minnesota’s pheasant count, which declined 29 percent from 2012, according to the Minnesota Department of Natural Resources (DNR). Minnesota’s 2013 pheasant index is 64 percent below the ten-year average and 72 percent below the long-term average. Pheasant hunters still are expected to harvest about 246,000 roosters this fall. That’s down 44,000 from last year’s estimate and is less than half the number of pheasants taken during the 2005-2008 seasons when hunting was exceptionally good. The highest pheasant counts were in the southwest region, where observers reported 51 birds per 100 miles of survey driven. Hunters should find good harvest opportunities in west-central, east-central and south-central Minnesota. The most important habitat for pheasants is grassland that remains undisturbed during the nesting season. Protected grasslands account for about 6 percent of the state’s pheasant range. Farmland retirement programs such as Conservation Reserve Program (CRP), Conservation Reserve Enhancement Program, Reinvest in Minnesota and Wetlands Reserve Program make up the largest portion of protected grasslands in the state. High land rental rates and competing uses for farmland diminish the economic attractiveness of farmland conservation programs. CRP enrollment declined by 63,700 acres in Minnesota’s pheasant range over the last year and contracts for nearly 400,000 acres of statewide CRP lands are scheduled to expire during the next 3 years. If not re-enrolled, this would reduce CRP acres in Minnesota by 30 percent. To help offset continued habitat losses caused by reductions in conservation set-aside acreage, the DNR has accelerated acquisition of wildlife management areas in the farmland region of Minnesota. The U.S Fish and Wildlife Service also acquires and protects habitat across the state. In addition, the DNR supports habitat conservation on private lands by working with a variety of partners in the Farm Bill Assistance Partnership and Working Lands Initiative. High spring precipitation and below average temperatures hurt nesting this year. This year’s average hatch date was delayed to June 20, which is 11 days later than the 10-year average of June 9. Although fewer broods were seen, brood size was larger than last year and comparable to the long-term average. Actual reproduction rates may be higher than the survey suggests. Hens that were successful nesting later in the season tend to be underrepresented in roadside data and it is possible that hens were still nesting or in heavier cover with young chicks during the survey period. The pheasant population estimate is part of the DNR’s annual August roadside wildlife survey, which began in 1955. DNR conservation officers and wildlife managers in the farmland region of Minnesota conduct the survey during the first half of August. This year’s survey consisted of 171 routes, each 25 miles long, with 152 routes located in the ring-necked pheasant range. Observers drive each route in early morning and record the number and species of wildlife they see. The data provide an index of relative abundance and are used to monitor annual changes and long-term population trends of pheasants, gray (Hungarian) partridge, cottontail rabbits, white-tailed jackrabbits, mourning doves and other wildlife. 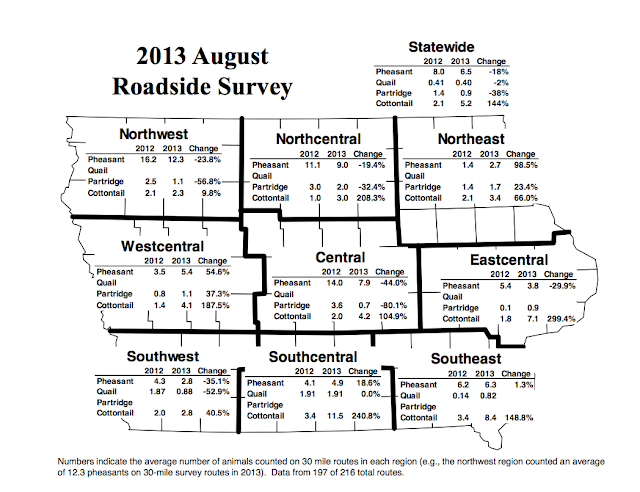 The gray partridge index also decreased from last year and remained below the 10-year average. The cottontail rabbit index increased from last year but stayed below the 10-year and long-term average. The jackrabbit index was 87 percent below the long-term average. Finally, the mourning dove index was 20 percent below last year and lower than the 10-year and long-term averages. Months of persistent drought in 2012, a cold, wet spring in 2013 and a reduction in habitat have impacted pheasant brood counts, according to a report released today by the South Dakota Game, Fish and Parks Department. But officials note that South Dakota will still offer the best pheasant hunting experience in the country, with more than 1.1 million acres of public land available for pursuing birds within the state's main pheasant range. The department's annual brood count surveys the number of pheasants per mile as a means to track pheasant numbers over time. The actual population size is estimated after the pheasant hunting season ends, with additional information gathered from hunter surveys and a winter rooster-to-hen ratio survey. 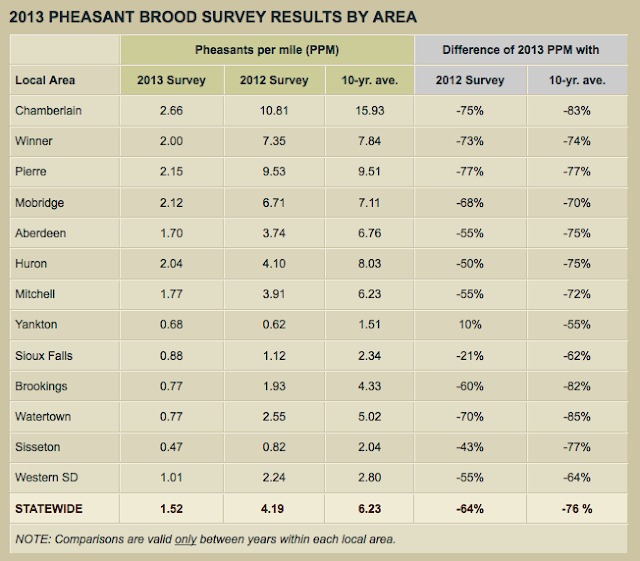 The 2013 report indicates an index of 1.52 pheasants per mile, down from 4.19 pheasants per mile last year. "The annual brood count provides us with a year-over-year analysis tool," said Travis Runia, GFP's lead pheasant biologist. "Our numbers may be down from last year, but hunters will still be able to find birds." GFP conducts the brood route survey each year on select stretches of roads around the state. All pheasants are counted along each route, with particular attention to the number of broods. "Much of the northern Great Plains experienced the same weather and habitat factors that impacted our brood counts," Runia said. Runia noted that lower brood counts in 1992 and 1997 still resulted in almost one million pheasants harvested in South Dakota each year. Since 1992, the state has added 350,000 acres of public access within the main pheasant range, expanding hunting opportunities. The 2013 pheasant season opens Oct. 19 and runs through Jan. 5, 2014. The Youth Pheasant season will run from Oct. 5 - 9 and the Resident Only season Oct. 12 - 14.